Was this the turning point for our season? I was at the game against Hull this weekend and I have to say that I’m quietly confident that our season has finally turned around. Granted, the game was very poor and there are a lot of confidence issues running through the team at the moment. The same could be said about the performance against Burnley but to end up with two clean sheets and six points from those two games will have worked wonders for the morale. On paper, this side looks amazing and should be challenging in the top six of the league. Quite what has gone wrong so far this season is beyond me as it is everyone else who has tried to figure it out. Some of it might be the bedding in to the new stadium and surroundings, some of it could be the dreaded second season syndrome which claims a lot of managerial victims. Looking at the way the team were playing against Hull, there seems to be a fear of losing the ball. Every time West Ham had possession in a good position, I was expecting the likes of Antonio, Payet and Lanzini to run past their defender and put a ball in the box for big Andy to nod it home. However they kept hesitating and looking to ensure possesion was kept and opted for a side or backward pass. There wasn’t a trust in their own skill or talent, no risks were being taken to try and carve out an opportunity. This is all down to confidence. In the second half of the game against Hull, once they started making runs, taking on defenders and playing the riskier forward passes, it paid off. 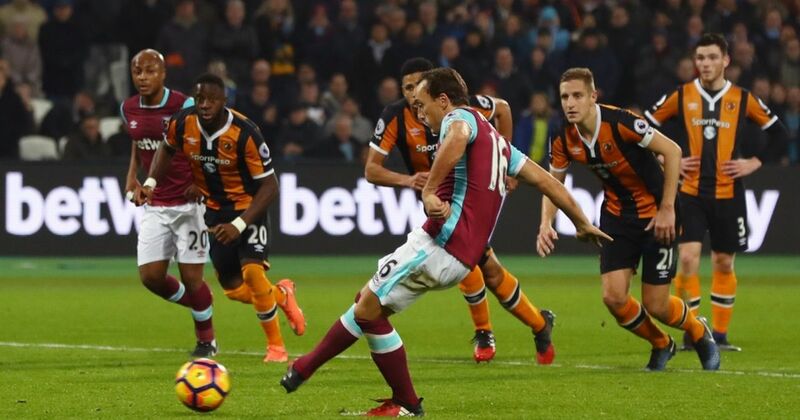 They were creating more chances and although it didn’t always end up with an attempt on goal it did make them look like they could score and it wasn’t long before it forced Hull’s defence into the vital mistake that conceded the penalty. After taking the lead, West Ham were playing with a little bit more freedom and continued to create a few more chances. Had they played like that from the first whistle we would have been discussing a 3-0 victory rather than how lucky that the post came to the rescue for the Hammers on a few occassions and how lucky they were to win the game. Regardless of how bad the game was to watch, I still think that winning ugly when you have been in a scrap at the bottom of the table is a huge boost and I will continue to take those scrappy 1-0 victories all season long. The team need to believe in themselves more than they do and use these last few games as a stepping stone to string together a couple more decent results against Swansea and Leicester. If they can do that and also start stringing some good football together as well, there is no reason why we shouldn’t be looking at the Hammers in the top 10 of the table come the end of the season. The new place will eventually become a fortress as well, and the manager is putting together a good squad (besides the fact that this summer’s transfer window was a failure) that will eventually play to its full potential and challenge for honours, I’m sure of it.